US, 1988, 94 minutes, Colour. Donald Sutherland, Chad Lowe, Mia Sara. 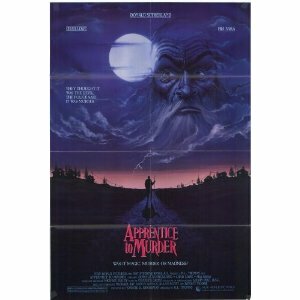 Apprentice to Murder is `inspired by a true story'. It tells the story of an eccentric healer who has spent some time in an institution. However, in a Pennsylvania town of 1927, he is able to heal, save harvests and influence people in their religion. The doctor is played, quite effectively, by Donald Sutherland. Chad Lowe is Billy, a 16-year-old who is attracted by the doctor, becomes friends with him, learns to read, helps him in his work and is at pains then to save him from the curses of an enemy. There are overtones of Satanism - and the audience wondering what is real and what is unreal. The film re-creates Pennsylvania in the late '20s, is filmed beautifully in the Pennsylvania countryside. The performances are strong, audiences are involved with the characters. The film was directed by Canadian R.L. Thomas (Ticket to Heaven, The Terry Fox Story). 1. Interesting drama? True story? Characters? Environment? Healing, health, magic, religion? 2. The Pennsylvania setting? The town and the countryside? Philadelphia? Decor and costumes? Musical score? 3. The title, the focus on Billy, his relationship with John Reese? The culmination and the death of the enemy? Prison sentences? 4. The focus on Billy and seeing characters and situations through his eyes? At home, his love for his mother, the clashes with his alcoholic father? Brutality and injury? At work? Meeting Alice, the friendship, the love affair? His meeting John Reese? Personality attraction, admiration, role model? The healings? The healing of his eye injury? The potion to cure his father - his father's illness and the potion's success? The drawings for him? Healing in the town? The death of the animals? The puzzle about the madman in his house? Learning to read? Reading in church? Friendship with Clay? The better bonds with his parents? The decision to go to Philadelphia? The attack on Reese? His feeling he had to stay? Helping him with the magic, the visit to Philadelphia, with Rufus? With the black woman? Potions? Going to the house, the confrontation with the enemy, the burning? The house burnt down? The return to the scene - the trial, his condemnation? The final information that he served his sentence, became an artist, married Alice? The effect of this experience in his life? 5. John Reese, his presence and manner? Healings? Superstitions and magic? Hexes and Satanism? Bible Christianity? The background of people persecuting him, in the mental asylum? The police arresting him for malpractice? Billy getting the bail money and taking him out? His character, intensity? The strange experiences in his house - Satan, madness? Fits? Preaching? The healing? The people attacking him? The death of the animals? The mystery of the drawings? The fire? Going to Philadelphia? Meeting Rufus, the woman and her potions and rituals? The performance of the rituals, the fire-breathing enemy, the burning of the house? Stabbing the victim? The arrest, his jailing? Serving his sentence and going back to practise? 6. Alice, in the town, relationship with Reese? The factory, attraction to Billy, friendship, sexual relationship? Working with him, going to Philadelphia? Waiting for him at the end? 7. Billy's mother and father, tension at home, alcoholism? The work? His father's sickness and cure? The bond between them? The father finding the potion? Turning against the mother? The meaning of the fire, the burning house? The funeral? 8. Clay and his friendship with Billy? His link with the curse in the village? The death of his cat, the burial ceremony and Billy's kindness, the prayer? Wanting to help at the end? 9. The solitary man, seen as the enemy, as mad? The threat to Reese? At the end, breathing fire, his death? His being a villain in Reese's imagination or not? 10. Rufus Miller, the traditions of magic and healing? The woman? The effect on Reese? 11. The backwoods, seasons and crops? Prayer, hexes? Superstitions and traditions? Satanism? Reese in this context? His own beliefs? Billy growing up in this atmosphere? Learning, superstition? Breaking through?